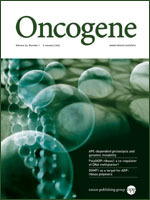 Please note that you need to be a subscriber or site-licence holder to enjoy full-text access to Oncogene. In order to do so, please purchase a subscription. © 2016 Nature Publishing Group, a division of Macmillan Publishers Limited. All Rights Reserved.